We are glad to announce our partnership with Clickadu – high-performing traffic source for media buyers. This rapidly growing ad network for web and mobile channels is specialized in popunders and has a number of exclusive sites, self-made high innovative technologies, anti-malware, bot and fraud filtering IT tools, not to mention the high-skilled international team. Convenient payment methods: Wire, Paypal, Epayments, Paxum, Webmoney, Credit Card. Use the bonus code BEMOB while signing up to get $20 extra to your first deposit from $100 to $299 or 10% extra if you deposit more than $300. Hurry up to use it through 5 May 2017! To make your work easier, here is our step-by-step user guide about how to integrate conversion tracking with BeMob. Log into your Clickadu Advertiser Account, click on the Tracking tab. Your Clickadu postback URL is created automatically. Log in to your BeMob account, choose the Traffic sources tab and then click the New button. As Clickadu is already introduced to our recommended traffic sources, all you have to do – just find it in the list. 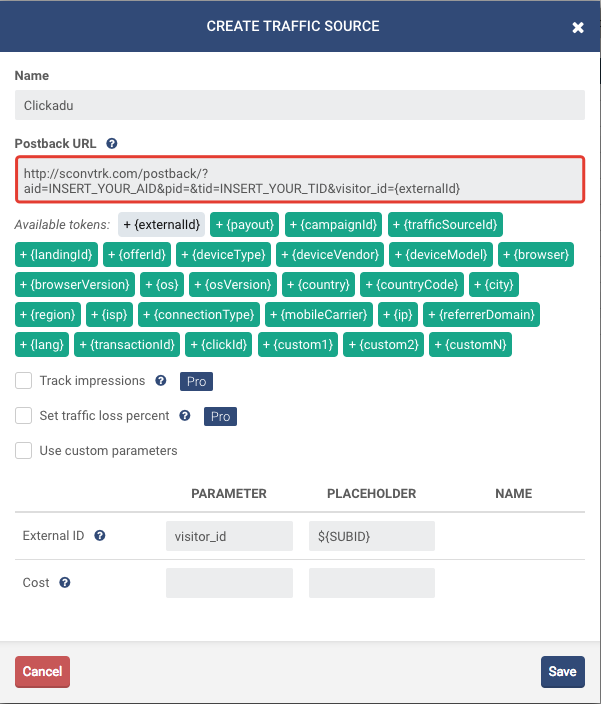 Don’t forget to replace to INSERT_YOUR_AID and INSERT_YOUR_TID with actual values from postback URL that we created in Step #1 and can be found on Tracking screen in your Clickadu account, otherwise your conversions will not be tracked correctly. After completing all replacements, click Save to store your Clickadu settings in BeMob. If you want to introduce any changes, select Clickadu from the list and click Edit button or right-click the selected traffic source. To get notified about conversions from affiliate network you need to generate the Postback URL on BeMob containing the “CLICK ID” and add it to the affiliate network’s panel. Contact our support team or your affiliate network support for assistance. Click Campaign button on the Dashboard, then press New. 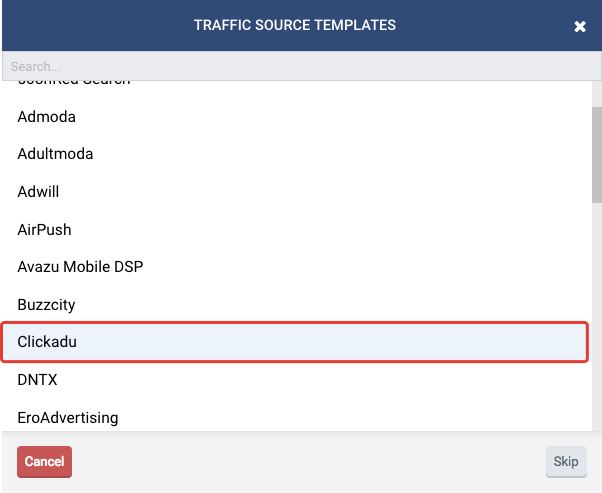 Select Clickadu as the Traffic source and fill out all other mandatory fields. Once you’ve finished setting up your campaign’s destination paths click on Save. This will create a new campaign within the Campaigns list and also generate the Campaign URL required to direct traffic to. Login to your Clickadu advertiser account, click Campaigns tab and then Create Campaign button (or edit one of your existing campaigns). 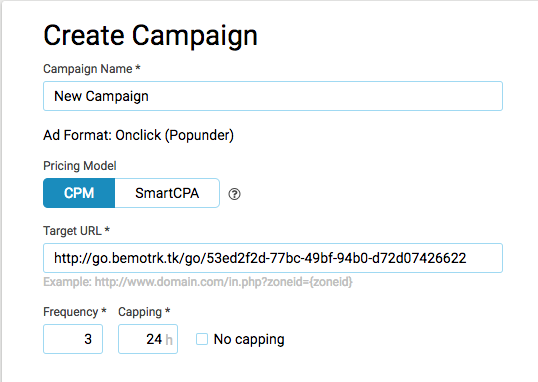 Copy the Campaign URL with all parameters from BeMob campaign settings. Place the copied link as Target URL for your campaign on Clickadu. Congratulations! The integration is finished!